May 5th, 2013 was a rewarding day for many. Tulalip Tribal member, Tyler Fryberg swept all four of his events, qualifying him for the Special Olympics State Tournament. Marysville Pilchuck produced just about 100 student athletes to volunteer with this years’ Special Olympics, Regions/State Qualifier. The boys volunteered to help every athlete, but had a special interest in fellow Tulalip athletes, Tyler Fryberg and Bruce Williams (not pictured). They were really happy to be there to help, but the amount of intensity that comes along with these athletes is amazing. They take their events serious and train very hard to compete and hopefully make it to the State Tourney, held at Fort Lewis. 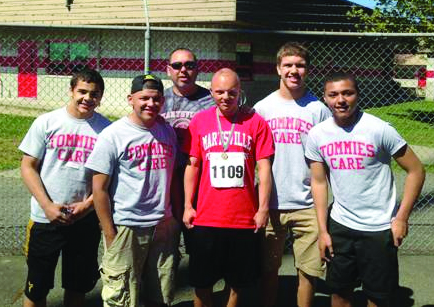 Tyler is not only a hero for people of Tulalip, but his fellow athletes, their parents and coaches make if clear that they enjoy watching him compete. Tyler competed in four events Sunday, the Shot Put, 400-meter run, 100-meter, and the 400-meter relay. He swept all four events, bringing home four gold medals. Although, Tyler had his own cheering section of Tulalips, crowds would gather when it was his heat to race. Tyler pretty much dominated all of his events with the exception of the 400-meter sprint. This was very intense, as he was in second place for most of the race, but coming into the home stretch, Tyler turned on the afterburners and closed the gap on the leader, and with about 20 feet to the finish line, he passed the leader and won the race. This was a great finish to a great race and the crowd went crazy. We as fellow Tulalips are very proud of these guys and of course their fellow athletes for their heart and dedication. You are definitely an inspiration to the Tomahawk Athletes who were there, showing that with drive and determination, we can all be great. When 1 Tulalip succeeds, all Tulalips succeed. Thanks you guys, for the great day, and good luck at State. This entry was posted in Sports and tagged Special Olympics, Tulalip, Tyler Fryberg by Kim Kalliber. Bookmark the permalink.